What a night, huh? The show that Seattle put on Tuesday night was mind-blowingly awesome on so many levels…the pre-party, the march to the match, the songs in the supporters section, and that beautiful, glorious tifo. Seattle deserves a lot of credit for creating one of the best game experiences of my 20 years of following US Soccer. But as I was reading stories about the match from Business Insider, the blogosphere, but in particular, Jerry Brewer’s column in the Seattle Times, I felt like we need a little parenting perspective on this game, and I’m just the soccer mama to do it. Seattle, what you did was amazing, but to say this was all Seattle culture, or just a normal night, makes us here in the rest of the US Soccer world a little uncomfortable. Last night wasn’t about Seattle soccer. It was about Seattle hosting US Soccer. Of the 41,000 tickets sold for this match, 15,000 of us came from out of state, a full 37% of the people, according to US Soccer’s presentation at their Official Supporters pep rally. The people that are willing to travel like that to games, to not only pay $50 without complaint, but spring for a $300+ flight and take vacation time….we don’t sit in the upper bowl. That impressive performance in the supporters section came from a diverse group of supporters. Within my arm’s reach were supporters from England (who was noticeably stunned by how far American soccer has come, saying “I didn’t think I’d see anything like this for another five years), Des Moines (Iowa, not Washington), Denver, Portland, and yes, Emerald City Supporters. 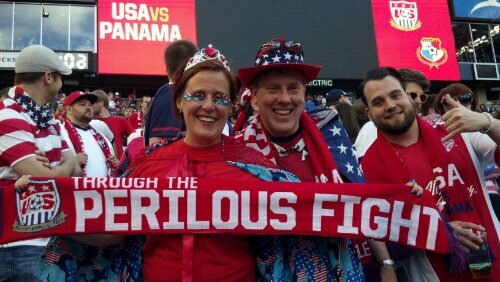 I had friends in the crowd from DC, Detroit, Kansas City, and more, 49 states represented in attendance, according to US Soccer. 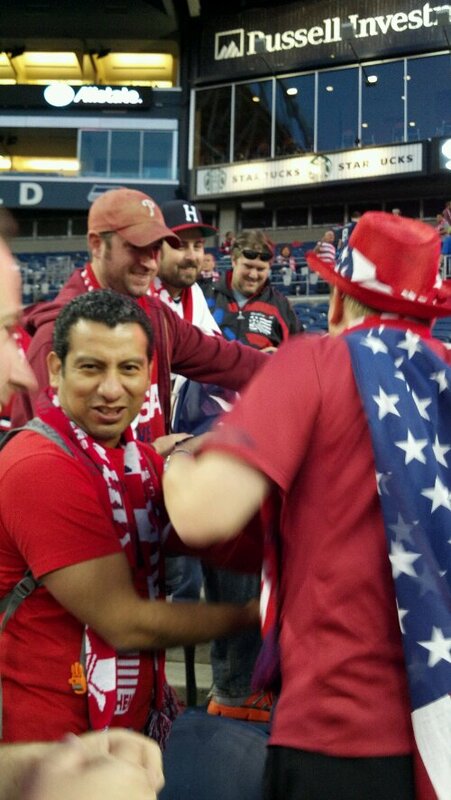 We bring the diversity of supporter clubs from all over the USA, and there’s an opportunity to learn from us. I would be so disappointed if I heard my child present their group project at school, but try to make it sound like the project was a success because they were so awesome at making projects, that everyone else’s projects pale by comparison, even as the other members of the group that had done work were standing there. Seattle was amazing last night, in large part due to the tireless hundreds of hours put in by American Outlaws, Seattle chapter, but also thanks to members from chapters around the US, who shouted ideas to Seattle capos and helped keep fresh chants flowing. If Seattle does get another game, and I hope they do, I hope they’re a little more open to asking for help. Yes, you do Sounders supporting, week in and week out, and you do it with skill that puts you among the best atmospheres in the US. But there are those of us that do US Soccer, year in and year out, and we love supporting our team as much as you love supporting yours. Just ask nicely, and we’ll help you hang banners and distribute song cards. I really enjoyed last night, working with capos with microphones, and I loved learning new songs that are unique to the Pacific Northwest. You know what would have been awesome? Allowing us out of town capos to teach you some of our songs from around the United States. Because I got “Everywhere we go” started (mic free!) in my section, but if the capo with the mic doesn’t know that that song ends with “clap clap clapclapclap clapclapclapclap USAaaay!” then we all sound silly as it grinds to a halt, as we are all clapping, but the mic guy is launching into the 2nd round of singing. It’s OK for you to learn from us, as we learn from you, it will only make you stronger. I have two kids. Would any of you ever seriously ask me which one is my favorite? Of course not. I’ve watched US Soccer in eight countries and 12 states, and I’m not going to pick a favorite, nor should you ask me. I’ll tell you that I love the Member’s Bar and stand at Sporting KC, and I cried last September in Columbus the first time I heard a US Soccer crowd chant throughout the stadium and stand for an entire match, I loved Denver and Tampa, where the crowds faced some of the worst weather I’ve ever dealt with in a match with a wonderful sense of humor and adventure. And I love, that for my 40th match supporting US Soccer, I got to be with you, Seattle, under the most impressive tifo I’ve ever seen. But I wouldn’t say it was my favorite, because I love all those experiences for different reasons. I don’t have to love you “the best,” and by now, you should be confident enough that you don’t need that to feel good about yourself. You are a great soccer city, but you won’t become a greater soccer city until you open your doors and let us share our passion with you. Because the USA chant that everyone is writing about at the end of the match was cool…but what’s cooler? A loud, slow, haunting rendition of “You’ll neeeever beeeat the US (clap!) “You’ll neeeever beeeat the US (clap!) Just throw me the megaphone in the 88th minute next time…I’ll start it up for you. The crowd in Seattle knows how to pitch in and help fold the Midwest Mama. Thanks to everyone who helped!